Winning a competition predicts dishonest behavior. 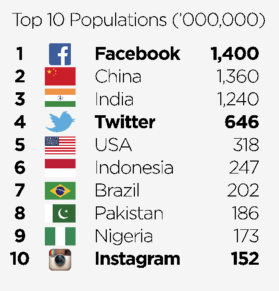 Competition is prevalent. People often resort to unethical means to win (e.g., the recent Volkswagen scandal). Not surprisingly, competition is central to the study of economics, psychology, sociology, political science, and more. Although we know much about contestants’ behavior before and during competitions, we know little about contestants’ behavior after the competition has ended. Connecting postcompetition behaviors with preceding competition experience, we find that after a competition is over winners behave more dishonestly than losers in an unrelated subsequent task. Furthermore, the subsequent unethical behavior effect seems to depend on winning, rather than on mere success. Providing insight into the issue is important in gaining understanding of how unethical behavior may cascade from exposure to competitive settings. Abnormal cortical folding correlates with trait anxiety. Dispositional anxiety is a stable personality trait that is a key risk factor for internalizing disorders, and understanding the neural correlates of trait anxiety may help us better understand the development of these disorders. Abnormal cortical folding is thought to reflect differences in cortical connectivity occurring during brain development. 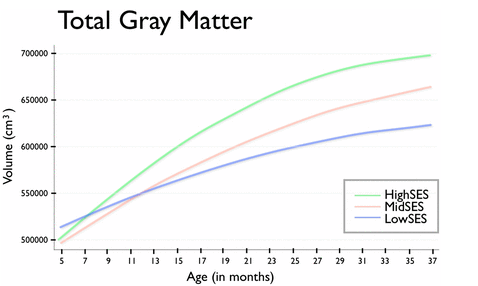 Therefore, assessing gyrification may advance understanding of cortical development and organization associated with trait anxiety. Previous literature has revealed structural abnormalities in trait anxiety and related disorders, but no study to our knowledge has examined gyrification in trait anxiety. We utilized a relatively novel measure, the local gyrification index (LGI), to explore differences in gyrification as a function of trait anxiety. We obtained structural MRI scans using a 3T magnetic resonance scanner on 113 young adults. Results indicated a negative correlation between trait anxiety and LGI in the left superior parietal cortex, specifically the precuneus, reflecting less cortical complexity among those high on trait anxiety. Our findings suggest that aberrations in cortical gyrification in a key region of the default mode network is a correlate of trait anxiety and may reflect disrupted local parietal connectivity. Inflated and pial surface maps of the left hemisphere demonstrating decreased gyrification in the precuneus as a function of trait anxiety.There was no relationship between anxiety and gyrification in the right hemisphere. Images on the left depict the medial view of the left hemisphere. Images on the right are a view from the top of the right hemisphere and are tilted 30 degrees to provide a better angle for viewing the cluster extent. Purzycki et al. combine laboratory experiments, cross-cultural fieldwork, and analysis of the historical record to propose that belief in judgmental deities was key to the cooperation needed to build and sustain large, complex societies. Since the origins of agriculture, the scale of human cooperation and societal complexity has dramatically expanded. This fact challenges standard evolutionary explanations of prosociality because well-studied mechanisms of cooperation based on genetic relatedness, reciprocity and partner choice falter as people increasingly engage in fleeting transactions with genetically unrelated strangers in large anonymous groups. To explain this rapid expansion of prosociality, researchers have proposed several mechanisms. Here we focus on one key hypothesis: cognitive representations of gods as increasingly knowledgeable and punitive, and who sanction violators of interpersonal social norms, foster and sustain the expansion of cooperation, trust and fairness towards co-religionist strangers. We tested this hypothesis using extensive ethnographic interviews and two behavioural games designed to measure impartial rule-following among people (n = 591, observations = 35,400) from eight diverse communities from around the world: (1) inland Tanna, Vanuatu; (2) coastal Tanna, Vanuatu; (3) Yasawa, Fiji; (4) Lovu, Fiji; (5) Pesqueiro, Brazil; (6) Pointe aux Piments, Mauritius; (7) the Tyva Republic (Siberia), Russia; and (8) Hadzaland, Tanzania. Participants reported adherence to a wide array of world religious traditions including Christianity, Hinduism and Buddhism, as well as notably diverse local traditions, including animism and ancestor worship. Holding a range of relevant variables constant, the higher participants rated their moralistic gods as punitive and knowledgeable about human thoughts and actions, the more coins they allocated to geographically distant co-religionist strangers relative to both themselves and local co-religionists. Our results support the hypothesis that beliefs in moralistic, punitive and knowing gods increase impartial behaviour towards distant co-religionists, and therefore can contribute to the expansion of prosociality. Several recent neuroimaging studies have found that creative cognition involves increased cooperation of the default and executive control networks, brain systems linked to self-generated thought and cognitive control. Default–control network interactions occur during cognitive tasks that involve the generation and evaluation of creative ideas. This pattern of brain network connectivity has been reported across domain-general creative problem solving (e.g., divergent thinking) and domain-specific artistic performance (e.g., poetry composition, musical improvisation, and visual art production). Default network activity during creative cognition appears to reflect the spontaneous generation of candidate ideas, or potentially useful information derived from long-term memory. The control network may couple with the default network during idea generation or evaluation to constrain cognition to meet specific task goals. Dorsolateral Prefrontal Cortex Connectivity During Musical Improvisation. 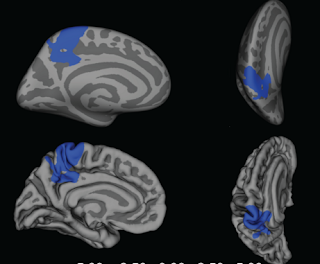 The right dorsolateral prefrontal cortex (DLPFC; green) shows differential connectivity as a function of task goals during musical improvisation in professional pianists. 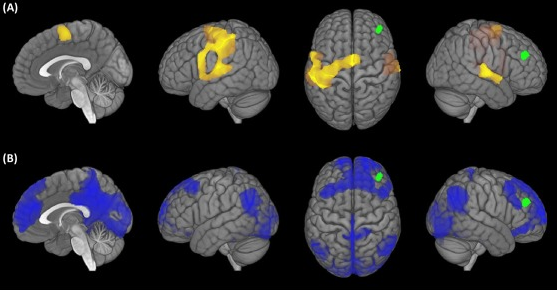 (A) Functional connectivity associated with the goal of using specific sets of piano keys; brain maps show increased coupling between the right DLPFC and motor regions (yellow, e.g., dorsal pre-motor area and the pre-supplementary motor area). (B) Functional connectivity associated with the goal of expressing specific emotions; brain maps show increased coupling between the right DLPFC and default network regions [blue, e.g., medial prefrontal cortex (MPFC), posterior cingulate cortex (PCC), and bilateral inferior parietal lobule (IPL)]. A mindfulness meditation intervention enhances connectivity of brain executive and default modes and lowers inflammation markers. Mindfulness meditation training programs, which train receptive attention and awareness to one’s present moment experience, have been shown to improve a broad range of stress-related psychiatric and physical health outcomes in initial randomized controlled trials...recent well-controlled studies indicate that mindfulness meditation training may reduce markers of inflammation (C Reactive Protein, Interleukin-6 (IL-6), neurogenic inflammation) in stressed individuals. One possibility is that mindfulness meditation training alters resting state functional connectivity (rsFC) of brain networks implicated in mind wandering (the Default Mode Network, DMN) and executive control (the Executive Control Network, EC), which in turn improves emotion regulation, stress resilience, and stress-related health outcomes in at-risk patient populations.... a cross-sectional study (N=25) showed that advanced mindfulness meditation practitioners had increased functional connectivity of a key hub in the default mode network (DMN) (i.e., posterior cingulate cortex) with regions considered to be important in top down executive control (EC) (dorsolateral prefrontal cortex, dorsal ACC), both at rest and during a guided mindfulness meditation practice. This coupling of one’s DMN at rest with regions of the EC network may be important for emotion regulation and stress resilience effects, as greater activation and functional connectivity of EC regions, such as the dlPFC, is associated with reduced pain, negative affect, and stress. Here we provide the first experimental test of whether an intensive 3-day mindfulness meditation training intervention (relative to a relaxation training intervention) alters DMN connectivity and circulating IL-6 in a high stress unemployed job-seeking community sample. IL-6 is an established clinical health biomarker that is elevated in high stress populations and is associated with elevated cardiovascular disease and mortality risk... unemployment is a well-known chronic stressor that can foster a loss of control, helplessness, and financial setbacks, and unemployment is associated with elevated inflammation. Building on initial cross-sectional evidence (17), we hypothesized that mindfulness meditation training would increase rsFC between the DMN and regions implicated in attention and executive control (dlPFC and dACC). Moreover, we tested whether mindfulness meditation training (relative to relaxation training) decreased circulating IL-6 at 4-month follow up, and whether pre-post intervention increases in DMN-dlPFC rsFC mediated IL-6 improvements at 4-month follow-up. Finally...a brain area specialized for music has been found. Norman-Haignere, Kanwisher, and McDermott have devised a new method to computationally dissect scans from functional magnetic resonance imaging of the brain to reveal an area within the major crevice, or sulcus, of the auditory cortex in the temporal lobe just above the ears that responds to music (any kind of music, drumming, whistling, pop songs, rap, anything melodic or rhythmic) independent of general properties of sound like pitch, spectrotemporal modulation, and frequency. They also found an area for speech not explainable by standard acoustic features. It is possible that music sensitivity is more ancient and fundamental to the human brain than speech perception, with speech having evolved from music. The organization of human auditory cortex remains unresolved, due in part to the small stimulus sets common to fMRI studies and the overlap of neural populations within voxels. To address these challenges, we measured fMRI responses to 165 natural sounds and inferred canonical response profiles (“components”) whose weighted combinations explained voxel responses throughout auditory cortex. This analysis revealed six components, each with interpretable response characteristics despite being unconstrained by prior functional hypotheses. Four components embodied selectivity for particular acoustic features (frequency, spectrotemporal modulation, pitch). Two others exhibited pronounced selectivity for music and speech, respectively, and were not explainable by standard acoustic features. Anatomically, music and speech selectivity concentrated in distinct regions of non-primary auditory cortex. However, music selectivity was weak in raw voxel responses, and its detection required a decomposition method. Voxel decomposition identifies primary dimensions of response variation across natural sounds, revealing distinct cortical pathways for music and speech. A commonly accepted assumption (that underlies all of the essays at dericbownds.net and many mindblog posts) is that a line of experiments starting in the early 1980s with Benjamin Libet’s work has demonstrated that our brains initiate an action 300 sec or more before our conscious ‘urge’ to move. It is as if we are ‘late’ to action because separate pathways are initiating the actual movement and our delayed ‘intention’ to move. This counterintuitive paradox has generated vigorous controversy for many years, debate of its implications regarding ‘free will’, etc. Schurger et al. point out that the ‘readiness potential’ (RP, a slow build-up of scalp electrical potential preceding the onset of subjectively spontaneous voluntary movements ) discovered 50 years ago was presumed to reflect the consequence of decision process in the brain (‘the electro-physiological sign of planning, preparation, and initiation of volitional acts’). A new generation of experiments is now suggesting that brain activity preceding spontaneous voluntary movements (SVMs) "may reflect the ebb and flow of background neuronal noise, rather than the outcome of a specific neural event corresponding to a ‘decision’ to initiate movement... [Several studies] have converged in showing that bounded-integration processes, which involve the accumulation of noisy evidence until a decision threshold is reached, offer a coherent and plausible explanation for the apparent pre-movement build-up of neuronal activity." Many have found Libet et al.’s results so striking because they appear to clash with our commonsense view of action initiation. However, the novel interpretation of the RP that the stochastic decision model provides actually suggests a close correspondence between the two. When one forms an intention to act, one is significantly disposed to act but not yet fully committed. The commitment comes when one finally decides to act. The stochastic decision model reveals a remarkably similar picture on the neuronal level, with the decision to act being a threshold-crossing neural event that is preceded by a neural tendency toward this event. In addition, dropping the problematic theoretical assumption that a decision to act cannot occur without being conscious also helps to dispel the apparent air of ‘paradox’ surrounding these findings. As with other types of mental occurrence, the decision to initiate an action can occur before one is aware of it. So we can identify the neural initiating event with a decision that we may become aware of only a brief instant later. All this leaves our commonsense picture largely intact. Finally, distinguishing between the decision to act and the earlier forming of an intention fits well with the distinction between a prediction and a forecast. If our concern is merely forecasting, what is relevant is the less-committed event of an intention's forming, which we identify with the neural tendency. If our concern is prediction, we should focus on the later event of deciding, which we identify with the crossing of the threshold. In humans, spontaneous movements are often preceded by early brain signals. One such signal is the readiness potential (RP) that gradually arises within the last second preceding a movement. An important question is whether people are able to cancel movements after the elicitation of such RPs, and if so until which point in time. Here, subjects played a game where they tried to press a button to earn points in a challenge with a brain–computer interface (BCI) that had been trained to detect their RPs in real time and to emit stop signals. Our data suggest that subjects can still veto a movement even after the onset of the RP. Cancellation of movements was possible if stop signals occurred earlier than 200 ms before movement onset, thus constituting a point of no return. A fascinating finding by Ohl et al. that the darting about of our eyes (saccades) during visual search is coupled to our heart rate (the R-R interval), proving a powerful influence of body on visuomotor functioning. During visual fixation, the eye generates microsaccades and slower components of fixational eye movements that are part of the visual processing strategy in humans. Here, we show that ongoing heartbeat is coupled to temporal rate variations in the generation of microsaccades. Using coregistration of eye recording and ECG in humans, we tested the hypothesis that microsaccade onsets are coupled to the relative phase of the R-R intervals in heartbeats. We observed significantly more microsaccades during the early phase after the R peak in the ECG. This form of coupling between heartbeat and eye movements was substantiated by the additional finding of a coupling between heart phase and motion activity in slow fixational eye movements; i.e., retinal image slip caused by physiological drift. Our findings therefore demonstrate a coupling of the oculomotor system and ongoing heartbeat, which provides further evidence for bodily influences on visuomotor functioning. In the present study, we show that microsaccades are coupled to heartbeat. Moreover, we revealed a strong modulation of slow eye movements around the R peak in the ECG. These results suggest that heartbeat as a basic physiological signal is related to statistical modulations of fixational eye movements, in particular, the generation of microsaccades. Therefore, our findings add a new perspective on the principles underlying the generation of fixational eye movements. Importantly, our study highlights the need to record eye movements when studying the influence of heartbeat in neuroscience to avoid misinterpretation of eye-movement-related artifacts as heart-evoked modulations of neural processing. Linking sustained attention to brain connectivity. Rosenberg et al. find that strengths of a specific set of brain connections - even when estimated from resting state data collected when subjects are not carrying out any explicit task - can be used to predict a subject's attention ability with high accuracy. A large set of connections is involved during successful attention, and a different large set correlates with lack of attention. Although attention plays a ubiquitous role in perception and cognition, researchers lack a simple way to measure a person's overall attentional abilities. Because behavioral measures are diverse and difficult to standardize, we pursued a neuromarker of an important aspect of attention, sustained attention, using functional magnetic resonance imaging. To this end, we identified functional brain networks whose strength during a sustained attention task predicted individual differences in performance. Models based on these networks generalized to previously unseen individuals, even predicting performance from resting-state connectivity alone. Furthermore, these same models predicted a clinical measure of attention—symptoms of attention deficit hyperactivity disorder—from resting-state connectivity in an independent sample of children and adolescents. These results demonstrate that whole-brain functional network strength provides a broadly applicable neuromarker of sustained attention. Everybody's a critic. And that's how it should be. ...criticism remains an indispensable activity. The making of art — popular or fine, abstruse or accessible, sacred or profane — is one of the glories of our species. We are uniquely endowed with the capacity to fashion representations of the world and our experience in it, to tell stories and draw pictures, to organize sound into music and movement into dance. Just as miraculously, we have the ability, even the obligation, to judge what we have made, to argue about why we are moved, mystified, delighted or bored by any of it. At least potentially, we are all artists. And because we have the ability to recognize and respond to the creativity of others, we are all, at least potentially, critics, too. ...It’s the mission of art to free our minds, and the task of criticism to figure out what to do with that freedom. That everyone is a critic means that we are each capable of thinking against our own prejudices, of balancing skepticism with open-mindedness, of sharpening our dulled and glutted senses and battling the intellectual inertia that surrounds us. We need to put our remarkable minds to use and to pay our own experience the honor of taking it seriously. It’s not just a job, in other words. Following up on my Jan. 28 post on Schwab's book "The Fourth Industrial Revolution" I thought I would pass on some speculations in the appendix of the book on the technology shifts enabled by digital connectivity and software technologies that might "fundamentally change society by 2025" (Really? Gimme a break...). Examples: A baby tech-enabled onesie which tracks babies' breathing, body movements, sleep patterns and quality and transmits that information in real time to a smartphone app. A Ralph Lauren PoloTech shirt with silver fibers woven directly into the fabric that read heart rate and breathing depth and balance, as well as other key metrics, which are streamed to computer or smartphone via a detachable, Bluetooth-enabled black box. A sensor that collects data about multiple chemicals in body sweat. Implantable Technologies - Pacemakers and cochlear implants represent a beginning. It is economically feasible to connect literally anything to the internet. Intelligent sensors are already available at very competitive prices. All things will be smart and connected to the internet, enabling greater communication and new data-driven services based on increased analytics capabilities...The Ford GT has 10 million lines of computer code in it. And, see The connected home. I am fatiguing,...the list continues with mention of smart cities, driverless cars, big data for decisions, artificial intelligence for decision making (and the decimation of current white-collar jobs), the sharing economy, 3D printing for manufacturing and health, personalized medicine, designer humans, neurotechnologies, brain technologies.....etc. Consciousness as the product of carefully balanced chaos. Loss of cortical integration and changes in the dynamics of electrophysiological brain signals characterize the transition from wakefulness towards unconsciousness. In this study, we arrive at a basic model explaining these observations based on the theory of phase transitions in complex systems. We studied the link between spatial and temporal correlations of large-scale brain activity recorded with functional magnetic resonance imaging during wakefulness, propofol-induced sedation and loss of consciousness and during the subsequent recovery. We observed that during unconsciousness activity in frontothalamic regions exhibited a reduction of long-range temporal correlations and a departure of functional connectivity from anatomical constraints. A model of a system exhibiting a phase transition reproduced our findings, as well as the diminished sensitivity of the cortex to external perturbations during unconsciousness. This framework unifies different observations about brain activity during unconsciousness and predicts that the principles we identified are universal and independent from its causes. A recent piece by Arianna Huffington (The fourth industrial revolution meets the sleep revolution) suggests to me one aspect of yet another driver of future inequality beyond the declining share of income going to labor compared with capital. Two clear castes of people are emerging, those who can adapt psychologically to the mind-numbing complexity of the emerging digital environment by optimizing their minds and bodies (meditation, sleep, exercise, diet, etc.) and those of lower socioeconomic status who start off disadvantaged (see yesterday’s post) and find that their only mental refuge is some form of fundamentalism, a closing rather than opening of their minds (cf. Donald Trump and Ted Cruz supporters.) Given the chaos and disruption being visited on traditional political and economic arrangements by the fusion of digital, biological, and physical advances - the internet of things meeting the smart factory meeting synthetic biology - how are all humans going to be able share in an understanding and shaping of these changes in a way that keeps human beings at the center? Analyses of the relation between obesity and mortality typically evaluate risk with respect to weight recorded at a single point in time. As a consequence, there is generally no distinction made between nonobese individuals who were never obese and nonobese individuals who were formerly obese and lost weight. We introduce additional data on an individual’s maximum attained weight and investigate four models that represent different combinations of weight at survey and maximum weight. We use data from the 1988–2010 National Health and Nutrition Examination Survey, linked to death records through 2011, to estimate parameters of these models. We find that the most successful models use data on maximum weight, and the worst-performing model uses only data on weight at survey. We show that the disparity in predictive power between these models is related to exceptionally high mortality among those who have lost weight, with the normal-weight category being particularly susceptible to distortions arising from weight loss. These distortions make overweight and obesity appear less harmful by obscuring the benefits of remaining never obese. Because most previous studies are based on body mass index at survey, it is likely that the effects of excess weight on US mortality have been consistently underestimated. ...a quote from Satya Nadella, the chief executive officer of Microsoft... “The true scarce commodity of the near future will be human attention.”...Putting aside Microsoft’s self-interest in promoting quick-flash digital ads with what may be junk science, there seems little doubt that our devices have rewired our brains. We think in McNugget time. The trash flows, unfiltered, along with the relevant stuff, in an eternal stream. And the last hit of dopamine only accelerates the need for another one. Egan suggests that gardening and deep reading of biographies are useful antidotes.